finally a little developer evangelism at Google perhaps? still pretty low-key, but i guess that's their style. doesn't necessarily mean it's a good style tho -- simplicity isn't always a virtue, especially when it could be confused with secrecy or disinterest. i don't know if that's really what's going on, but it does demonstrate a lack of prioritization on evangelism and platform education at Google. personally i think that's a huge mistake on their part. wouldn't it make more cents for these to be all in one place? and perhaps to have an overall program to work with developers on the Google platform? just a thought. Microsoft may not be the model for web-based developer evangelism (actually i'd say Yahoo's doing the best job right now), but there's certainly a lot to be learned from previous approaches. 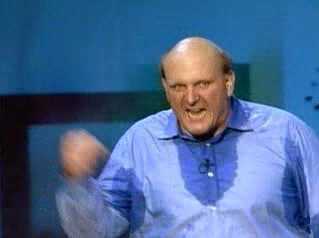 Ballmer might appear comically fanatical above, but at least in terms of focus & emphasis they got it right. smiley: yep, looks much better now. Google is the master of underpromising and underdeliverying - with the exception of their Analytics program, which should be in beta at best right now. Many of the APIs are complementary, so having a centralized developer system as opposed to the currnet silo APIs makes sense to me too. Thanks for the thoughtful opinion piece Dave. Nelson and his team recruited me to evangelize the AdWords API a few months ago and I agree that out style is not as flamboyant as Ballmer's (hilarious video).